You might have noticed that it's almost Christmas. Well, in advertising terms it is, and a slew of joyful commercials have been hitting the airwaves to celebrate the coming festive season. 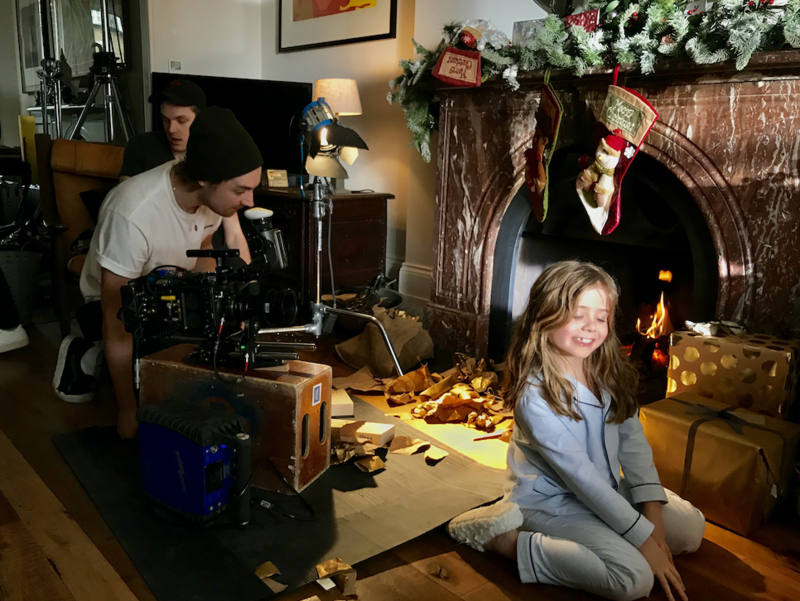 However, one director has taken a different approach with his newly released and darkly humorous short film, Last Christmas. London-based Oliver Kember [above right] says his mission statement is to combine beautiful imagery with mischievous comedy. "I have a background in cinematography and always bring that love and attention to my directing work," he says. "I aim to land somewhere between Tarantino and Wes Anderson in terms of a darkly comic tone and curated, timeless aesthetics." Above: Last Christmas from Oliver Kember on Vimeo. "Dan is just an absolute comic maestro and can’t help but make things funny, so once he agreed to do the film I knew that it would keep the tone right in the sweet spot between comedy and darkness." And Last Christmas does just that, pitting a sweet, precocious little girl who thinks she's stumbled into Father Christmas, against a wily man intent of stealing the presents from under her tree. Above: On location for Last Christmas. How did the idea for Last Christmas come about? Myself and my writing partner, Freddie Hall, have really enjoyed looking at key life events and challenging the expected set of emotions that go hand-in-hand with them. Christmas felt like a really good, logical moment for us to turn our hand to as writers. "The challenge was really in the edit and getting rid of lots of gems in order to keep the story tight and snappy." 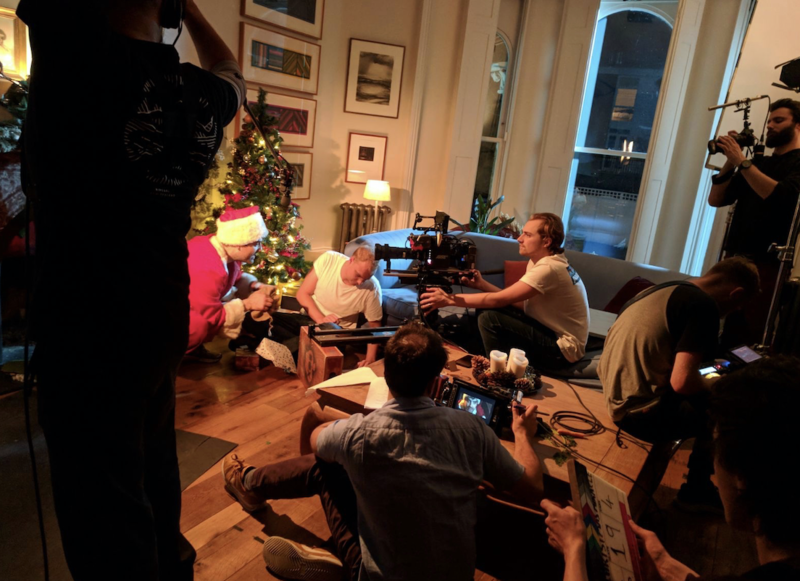 What made you want to make a film based around Christmas? Christmas is a time of year that we’re sold as nothing but joyful. As a filmmaker working in dark comedy, that’s asking for trouble! I’ve learned that nothing is ever sacred, and that life is always a mixed bag, so it almost seems more honest to tell a story that’s not quite as perfect as it should be. Beyond that, it’s just great fun for us as writers with a mischievous agenda. The cast members are great; how and where did you find Father Christmas and Polly? [Actor] Daniel Ings was someone I wanted to work with as soon as I saw him in Lovesick. Then later, watching him in The Crown there was a whole other side to him I hadn’t seen before. And Polly, well we watched a lot of audition tapes for the part of Polly and Poppy Polivnick just had a cheekiness to her that immediately resonated with me. She was acting way beyond her years and had a real fire in her that I found an amazing contrast to her small size. When she is full height, the world better watch out. She’ll be unstoppable. The film does a great job of balancing quite a dark story with a funny scenario; how hard was it to keep that balance? Thanks! I think structurally, the dramatic irony of the audience knowing who Steve is whilst the little girl tries to suss him out is a fun game to watch. More importantly though, Dan is just an absolute comic maestro and can’t help but make things funny, so once he agreed to do the film I knew that it would keep the tone right in the sweet spot between comedy and darkness. So many of my favourite lines and moments in the film came from Dan, but I won’t say which ones because it makes me and Freddie seem like better writers this way. But honestly, it’s all of the funny bits. Every one. Above: The crew hard at work. What was the most challenging part of the project and how long was the shoot? The shoot was one day. The challenge was really in the edit and getting rid of lots of gems in order to keep the story tight and snappy. The cast were so generous and creative that there is a whole outtakes reel of absolute gold that I would love to release some day. Maybe next Christmas. What are you asking Father Christmas for this year? More branded dark comedy work from all those brilliant and beautiful shots-reading creatives and producers. And world peace. 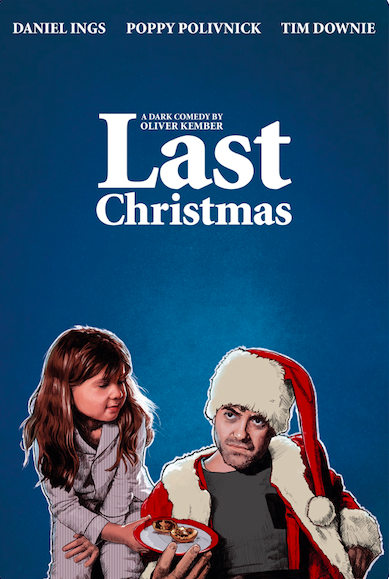 Above: The poster for Last Christmas.